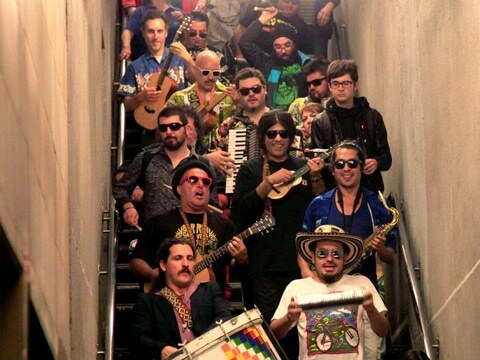 Chico Trujillo is Chile's most prominent Cumbia band. They are the soundtrack to every party from Santiago to Valparaiso. They can fill stadiums. Their mixture of classic cumbia and hints of rock and ska has assured them audiences from every generation and every walk of life. Chico Trujillo started as an offshoot of punk/Ska band LaFloripondio in 1999. Thirteen years and five albums later, the offshoot has come to symbolize a uniquely Chilean cocktail. One that is rooted in the cumbias of the pre-Pinochet days and manages to incorporate every aspect of Chile's popular culture. They have meshed bits and pieces of Chile's fragemented past with the global influence of alternative culture and merged it all under the pan-latin banner of Cumbia. It's the first time since ska erupted out of Jamaican onto the world’s dance floors (three times over) that a a popular musical movement not born in the United States is going global. This time, though, it’s a hispanophone movement, making huge headways in Latin America, Europe and Japan.